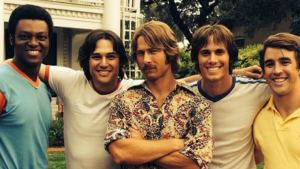 While next to Before Midnight and Boyhood Richard Linklater’s Everybody Wants Some!! takes place in the shallow end of the pool, not every movie needs to be a deep dive. Here is a review of his new movie, a kaleidoscope that has the freewheeling hijinks of Dazed and Confused but also the emotional intimacy of his more mature efforts. For me, each successive Linklater film makes me appreciate him more. Your thoughts?